Whales and penguins, beaches and cliffs are just some of the wonders that can be enjoyed in Península Valdés. This bay lives by and for nature. During summer time, postcards of the whales are replaced by those of penguins, sea lions and dolphins. Península Valdés is a unique place in the world where wildlife is always within reach, although it is forbidden to touch it. Our path begins on Provincial Route No. 2, to the north. The road passes through arid and low vegetation, home to thousands of species that can be seen from the vehicle’s window. Guanacos, chulengos, choiques, are all species that inhabit the area, and their appearance on the side of the road is a perfect excuse to slow down, take a couple of photos and listen carefully to the guide’s explanation — if you’re on a tour like us — or you can consult the brochures that are given to visitors when they enter this protected area of ​​Península Valdés. 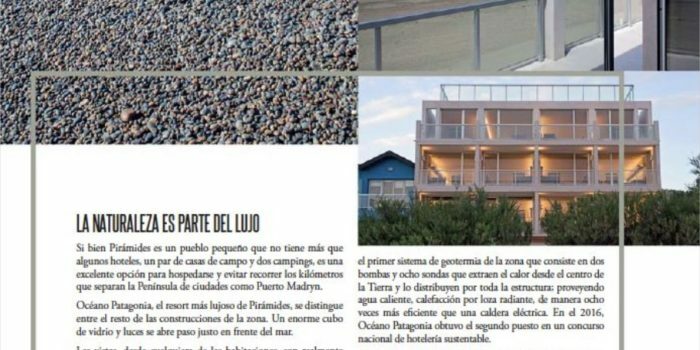 Puerto Pirámides, 100 kilometers from Puerto Madryn, is one of the most visited places on the Peninsula during the whale season — from June to December — and again very popular with locals in summer: many teenagers in the area come to this picturesque place to live their first vacation among friends. This small town, embedded in the middle of seaside cliffs, has stood the test of time. At some point it was an outlet for the salt produced in the center of the Peninsula. After the appearance of the refrigerators, Pirámides was left to oblivion until a group of pioneers saw a promising future in the whales that came to the area to mate or give birth to their young. In a good season, these animals can be seen even from the airplane window before landing. Although dependent on climatic conditions, one way to guarantee the spectacle is to take one of the daily boat excursions offered by several different agencies — all easily accessible on the main street of Pirámides. There are several options, from boats for 60 people to a kind of semi-submersible that allows you to see the whales below the surface of the sea. It is an unforgettable experience since the animals usually approach the boats, poking up their heads and tails tails right in front of guests. “They are very curious animals” repeats every one of the guides and that is for sure. 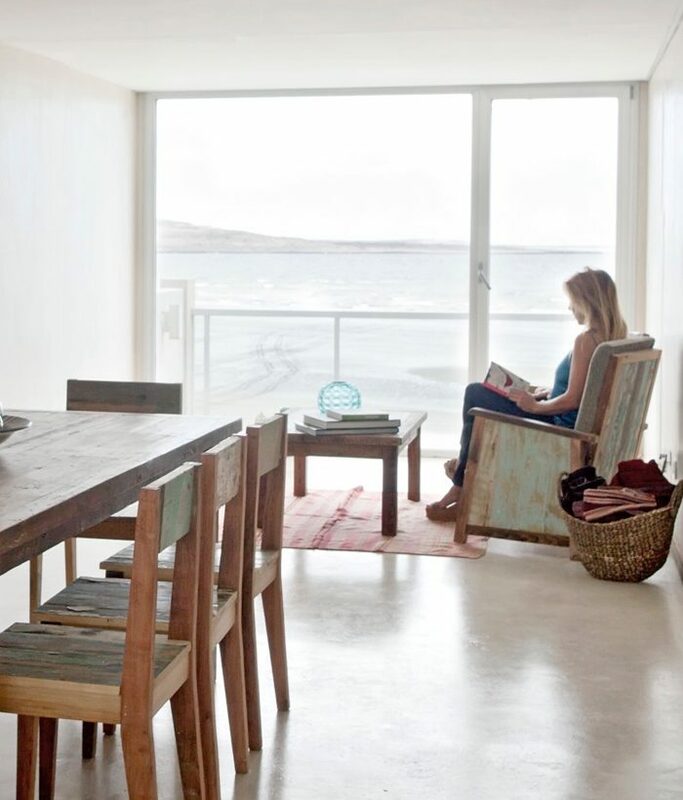 Although Puerto Pirámides is a small town that has only a few hotels, a couple of country houses and two campsites, staying in the town is an excellent option to avoid traveling the kilometers that separate the Peninsula from cities such as Puerto Madryn. Océano Patagonia, the most luxurious resort in Pirámides, stands out among the rest of the buildings in the area. It is a huge cube of glass and light right in front of the sea. The views, from all of the rooms, are really impressive. The sea, the sand and, during the season, the whales are all part of the landscape behind the glazed walls. “We wanted to make a bioclimatically-friendly hotel,” said Marcelo Battilana, one of the owners of Océano Patagonia. For that, they installed the first geothermal system in the area consisting of two pumps and eight probes that extract heat from the center of the Earth and distribute it throughout the structure; providing hot water and radiant heating, eight times more efficiently than an electric boiler. 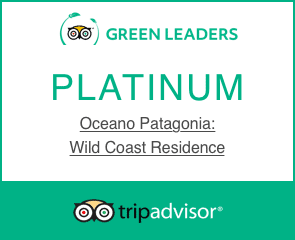 In 2016, Océano Patagonia won second place in a national sustainable hotel competition. In addition to this sophisticated system, all the construction and ornamentation of the building were executed to minimize the impact on the environment. For example: the walls and furniture were made from wood recovered from a fire in a tenement in La Boca, Buenos Aires. 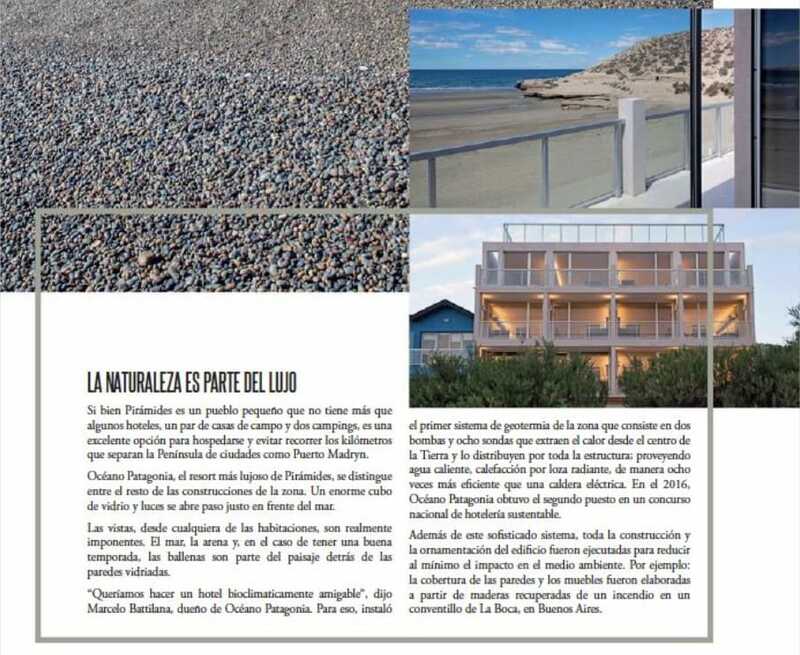 In the event that you are tired of seeing whales — which usually does not happen — the beaches of Punta Pardelas, 15 kilometers from Pirámides, and El Doradillo, 14 kilometers from Puerto Madryn, are excellent options for a visit. The first, Punta Pardelas, is a privileged place for lovers of sports diving, fishing and snorkeling. It is a special place to enjoy a quiet afternoon, observe the sunset and — with a bit of luck — see, from its cliffs, some sea lions and whales playing in the water. The second, El Doradillo, is ideal to see whales from the shore, walk over sand dunes and observe, touch — why not taste — the native plants of the area, such as wild thyme and quilimbay, among others. The landscape, which covers 80 kilometers from Puerto Pirámides to Estancia San Lorenzo, is flat, uniform, green. Green? Yes, this time of the year the grassland proves to be more alive than ever. “Mom, do we have to see a lot of penguins?” Asks the only child participating in the excursion. All the lands of Península Valdés are privately owned. Estancia San Lorenzo belongs to a recognized family of the area and its more than 5000 hectares shelters a colony of more than 500,000 Magellanic penguins. Before traveling the remaining two kilometers to reach the penguin colony, the hall of the estancia appears in the middle of the plateau. “This is a very Patagonian place,” says Cecilia, a woman from Puerto Madryn who is also taking part in the excursion. A shearing shed turned into a restaurant. The glass windows reflect the wind whipping small bushes and sheep being herded by a gaucho and his dogs. Inside the fire burns and roasts the lamb that will be our lunch. After a delicious meal, a van from the Argentina Vision tourism company starts up and we continue on our way. Grassland, dirt, dust… the smell of penguins. “But don’t penguins live in cold places?” Was the question that nobody asked aloud. Little by little, the animals begin to appear on the side of the road. “Mom! They are like the ones in the movie,” the child says enthusiastically. Suddenly, something magical happened: reality surpassed fiction. But not just any fiction. Reality surpassed the magic of Disney. Andes Airlines is the only airline that arrives at the Puerto Madryn Airport. New Peninsula Valdés Guidebook, free! Solar Energy @ Océano Patagonia!